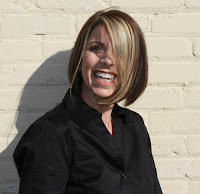 Nikol is the current president of the Minneapolis Modern Quilt Guild. I am originally from out west, I've lived in CA, WA, ID, MT and NV all before joining the Air Force. I moved to Mpls about 12 years ago from Texas with my two boys who are 18 & 15. I also have 3 pets, two dogs and a cat. My day job is running my business Sewtropolis, which is pretty much also my night job. Quilting and sewing have always been my main hobbies. I also like to bake, garden, re-upholster furniture and can jams & jellies. Wow, tough question. 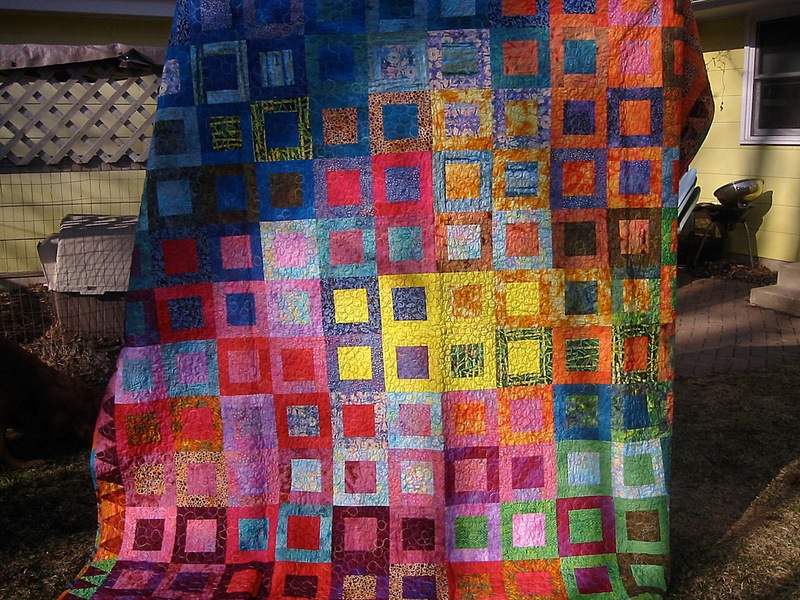 I have made quilts for all my friends, all their kids, my kids 3-4 times over, and myself... I'd say over 20 years I have finished 30-40 quilts. I narrowed down my UFO last year so my best guestimate is I have around 10 UFOs now. Sadly not as many hours as I'd like to spend. I'd say 4-5 hours on average. I try to sew whenever I get a few minutes here and there. My first quilt was a disaster, it and all the fabric I bought for it ended up at Goodwill! It took me about a year to give quilting another chance. My second quilt was a simple framed block. I fussy cut the center fabric (which were bears dressed as clowns if I remember right) into 6" squares and then put borders on it. It was such a success that I was hooked after that! My last quilt is always my favorite. However, a few years ago I took a fabric dying class and used the fabrics from the class (and subsequent dyeing adventures) into a king size quilt that is now in the store. It was truly a labor of love, as it's a king size and I quilted it on my home machine. It took be 3 full days of quilting at Quilt Retreat! I sew in my basement. It's not ideal, but after 30+ years of sewing I have accumulated a lot of stuff. I have a large cutting table, shelving for all my fabric, large ironing table and hutch that I designed and had made specifically to hold my stuff. When I sew I like to sip on wine and watch Dateline or Law & Order. If those two shows aren't on I'll usually plug in a movie that I've seen before since I won't be paying much attention to it anyway. As ideal as this sounds my space is in a basement with very tiny windows and horrible lighting! I also get side-tracked by the washer and dryer and all the laundry that needs to get done. Before owning a store I would buy any fabric that jumped out at me. I accumulated quite a few fat quarters since those were the easiest way to build my stash and I did a lot of 'patchwork' type quilting. When I found a quilt pattern that I wanted to make then I'd do out and buy fabric specifically for that project. Now that I own a fabric store, I end up bringing home lots of 'end of bolt' pieces. If there is fabric that I really, really like then I'll cut a yard or two and bring it home - but those usually end up in clothing. I don't manage my stash very well. One of my goals this year is to get it under control and develop a way to get it better organized into bins - on shelves! My favorite thing about quilting is that I can spend hours and hours at it, feeling lucky that I have a few minutes to 'relax' and at the end of all this 'relaxing' I have something beautiful and functional. I don't think there is one thing that I don't like about quilting..... other than not having enough time to do it. I want to learn how to use a long arm. 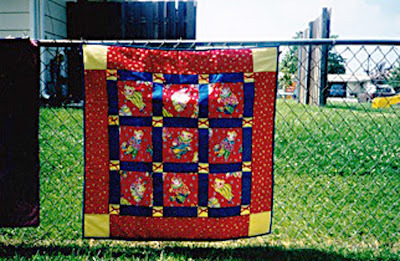 I quilt all my quilts on my home sewing machine and I think using a long arm would be faster and give them a more professional look. I don't tend to be afraid of trying a new technique, but I have learned my limits on what my capabilities are. One of the reasons I love quilting so much is because I know how to do it and it's a way for me to relax. I know that if I have to think too hard to create a quilt, then I probably won't finish it because I don't have the brain muscles left at the end of the day to dedicate to. Other dedicated quilters and the beautiful quilts they create inspire me the most. Right now I'd say I admire Elizabeth Hartman of "ohfransson.com" the most. Her designs are original and the fabrics she uses are always perfect choices. If your first experience wasn't a good one - keep at it.